Every year I lead a session with my confirmation class on "hot topics." Inevitably someone asks about tattoos. Specifically, they asked me whether it is a true that a Jewish person with a tattoo cannot be buried in a Jewish cemetery. The answer, as is the case with many such questions, is "it depends." There is no blanket prohibition on tattoos. Such a prohibition would prevent any survivors of Nazi concentration camps -- whose arms were branded with a number -- from residing in a Jewish cemetery. 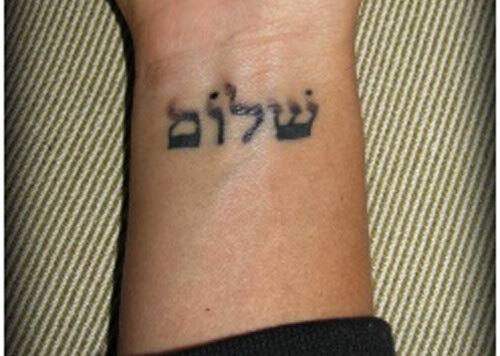 The Jewish view of tattoos is more nuanced. It reflects the purposes skin markings filled in ancient culture and the reverence with which we are to treat our bodies. What is Wrong with Tattoos? 1. Perception of Idolatry: Some groups in the ancient Near East used tattoos as a way of worshipping gods. Egypt in particular had several gods whose images were frequently tattooed onto bodies and household items. When Jews left Egypt and devoted themselves to worshipping one God, tattoos became a symbol of idolatry and oppression. Their prohibition distinguished the Jewish people from other groups. 2. Desecrating the Body: Some cultures draw a strong distinction between soul and body. Christian thinkers refer to the division between the flesh and the spirit. The apostle Paul, in particular, tends to view the flesh as wicked and the spirit as pure. Jewish tradition does not draw a sharp distinction between the two. They depend on one another, and both can do good or evil.The purpose of Jewish spirituality is to cultivate the good in both. Thus, the body is sacred and should not be marred unnecessarily. Consequently, we need to devote our body to sacred service. A tattoo does not serve this purpose. Rather, like smoking or drinking, it involves unnecessary dangers, such as harming our skin or causing infection. According to this point of view, the content of the tattoo is not as significant as the act of branding itself. As we can see, neither perspective connects getting tattoos with denial of admission to a Jewish cemetery. While Jewish tradition does not encourage us to go out and getting inked, it is too wondrous and nuanced to say they are a matter of life and death.